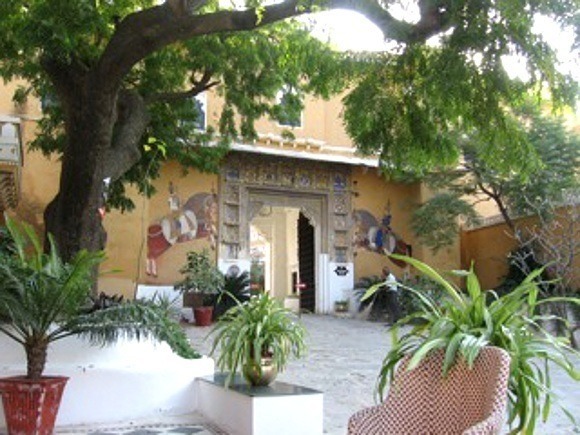 Vivian & Neil Reinhart of Vancouver Island, Canada discovered a truly royal welcome in Deogarh, Rajasthan in February 2012. I fell in love with this fairy tale palace perched high upon the hill with the country and villages spread out like a skirt around its base. Climbing up through the bazaars draped with colorful fabrics, shiny pots and pans and of course the usual cows casually picking their way through the crowds made for an exciting entrance, as was our welcome at the palace’s main gate where a shower of marigold petals was dispensed over us. All I could think of while exploring the passageways and steep narrow staircases of this 16th century structure is that I could play “hide and seek” with our five year old grandson for days! And indeed, the present Maharajah of Deogarh, now 77 years old did play that same game with the servants when he was a young child living in the palace. The first night under the stars was with local village girls doing traditional dances and a fire pit sending sparks into the sky. The next morning the sun rose and the temperature was very pleasant for our “rural ramble” in an open jeep. We got a close look at village life – with green lush fields being irrigated with wells pumped using oxen. The local people were curious but very friendly wherever we encountered them. One lady in a vivid pink sari handed us a bouquet of freshly-picked cilantro and fragrant chives over a fence! The following day we climbed the local, ancient hills of Deogarh with our driver and staff guide Vikram. It is here we found more abandoned forts and palaces! Neil discovered some of the oldest rocks on the face of the earth. On our last night we had a sunset tea at one of the nearby lakes and we were joined by another visiting couple from England. We watched the beautiful colors of the fading sun in the mirror calm of the lake. The Maharana, his son and daughter-in-law also joined us for a cup of tea at the water’s edge. The descendants of the palace were gracious and charming and all the staff at Deogarh Maghal treated us like royalty. Enchanting! 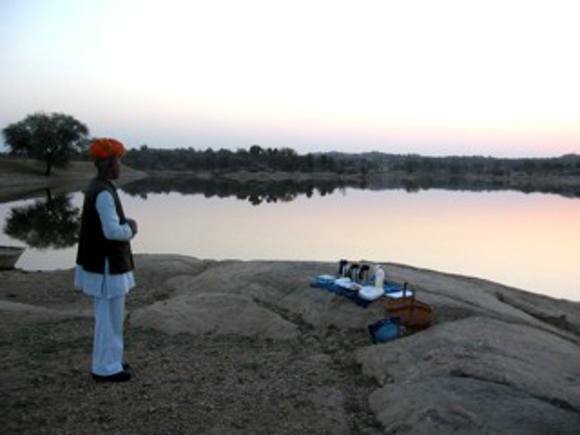 Discover your own rural treasure in Rajasthan, India with a private, tailor-made experience through Enchanting Travels!